The #1 ranked player in the world did it again. With a four-shot lead going into the round, Inbee Park cruised to a four-shot win. Park has won the last three tournaments, the last three LPGA major championships, and every LPGA major played in 2013. Park opened the final round with her closest challenger being In-Kyung Kim. Inky, my nickname for In-Kyung, was one of my picks for this week and one of my favorite players. I was pulling for her but Inky didn’t get closer than three shots to Inbee. No other golfer contended and Park won without much of a struggle. Lets put Park’s win in perspective. She has joined Se Ri Pak as the only South Korean golfer to win three different LPGA major championships. Pak has won five majors in her career. Park has four triumphs. Her first was the 2008 US Open. Park has won the last three LPGA tournaments played. She has won ALL three LPGA major championships this year. The last time a LPGA golfer won three majors in one year was Pat Bradley in 1986. Mickey Wright also won three major championships in 1961. The only other golfer besides Park to win the first three major championships in a year was Babe Didrickson Zaharias in 1950! 1950 was the LPGA Tour’s first ever season. Tiger Woods is the last golfer to win three majors in one year. He did it in 2000. Woods won four consecutive majors. The last three of 2000 and the 2001 Masters. It was titled the ‘Tiger Slam’. In 1961 and 1962, Mickey Wright won four straight majors but I might be about the only person to note it in recent memory. She won the last two majors of 1961 and the first two of 1962. Ben Hogan won three majors in 1953. Bobby Jones remains the only golfer to complete a Grand Slam. He did it in 1930. Note- Hogan won all three major championships he played in that year. The British Open and PGA Championship at that time were played at almost the same time. Hogan won the British Open but couldn’t compete in the PGA. Park is one win away– The Women’s British Open which she finished 2nd at in 2012 — from becoming the seventh golfer to win four different LPGA major Championships. The others are- Mickey Wright, Annika Sorenstam, Karrie Webb, Juli Inkster, Louise Suggs and Pat Bradley. Ordinarily a Park British Open triumph won give Park a career Grand Slam, except the LPGA has designated the Evian Masters as a major championship also. Beginning THIS YEAR. So Park would have to win two more majors this year to do a Bobby Jones. Memo to LPGA Commissioner Michael Whan- Do you wish now that the Evian wasn’t made into a major championship? Inbee Park BTW is the defending Evian Masters champion. So Park will be going for four majors in one year in a little over a month. It will be played at St. Andrews, the same course Tiger Woods completed a career Grand Slam at back in 2000. A run at golf or any other sports history like this would ordinarily gather lots of media attention but I’ll be surprised if the Women’s British Open gets more than a minor increase in coverage. Golf bloggers who I won’t mention, are paying attention to silly things from golfers with wet pants to a player firing their caddy in the middle of a round. Newspapers will have the story buried on page 8. They can hardly be bothered to write about a LPGA major and I’m not expecting much from them on the WBO ESPN does broadcast the WBO, but I again will be surprised if they do anything extra for this year’s tournament. That Park is South Korean, has something to do with it. The ugly reality is that a good chunk of the media has a bias towards the Asian players. I will however the 4th major being not in the United States will be one reason for the limited coverage though the Men’s British Open rarely has trouble getting talked about. If it was Paula Creamer going for the Slam five weeks from now in say New Jersey, there would be plenty of people writing and talking about it. With Park trying to do it in Scotland, hardly anybody. It is the second straight major championship triumph for the 24-year-old South Korean. Thirty-six holes of golf were not enough, but 39 worked out just fine for Inbee Park at Locust Hill Country Club on Sunday. Park, the world’s top-ranked player, defeated Scotland’s Catriona Matthew in a three-hole playoff Sunday afternoon to win the Wegmans Rochester LPGA Championship, the second major on the LPGA Tour schedule this season. The playoff was the sixth in the 37-year history of LPGA golf in Rochester and the first since Lorena Ochoa defeated In-Kyung Kim in 2007. Park, 24, shot a 4-under-par 68 in the third round on Sunday morning but struggled down the stretch in the afternoon to a final-round 75 with bogeys on three of her last five holes (Nos. 14, 16 and 18). Park and Matthew matched pars on the first two holes of the playoff (Nos. 18 and 10), but Matthew found the right rough off the tee on the third playoff hole while Park hit the fairway and was safely on the green in two shots. Matthew chipped her fourth shot on and had about 15 feet left for bogey, but Park sank a birdie putt from about 18 feet to seal her third major victory. Suzann Pettersen of Norway shot the low round of the week, a 65 on Sunday afternoon, to tie for third with Morgan Pressel, the 36-hole leader who began Sunday with a two-shot lead over Park and Chella Choi, at 4-under. The victory makes Park, a native of Seoul, South Korea, the seventh woman in LPGA history to win the first two majors of the season. She also captured the Kraft Nabisco Championship in April. Asian-born players have won the last nine majors on the LPGA Tour. Park nearly didn’t win today. Her driving was not very good throughout and she played the 72nd and last hole of regulation terribly. She needed to get up and down from the fringe to make bogey and get in the playoff. Nevertheless Park came out on top. She now hold three legs of the Women’s Grand Slam. Before this year, she’d be one win away(The Women’s British Open) from a career slam but the LPGA decided to elevate the Evian Masters to major status. So she needs two more wins now. The way Park is playing right now, I wouldn’t bet against her winning another major this year. Bypassing conventional wisdom in the draft, the Diamondbacks used the 1,020th overall pick of the draft on Arizona State’s Cory Hahn, an outfielder who was partially paralyzed during a game in 2011. Hahn was one of the nation’s top prospects in 2010, when he was California’s Mr. Baseball after leading Mater Dei High School to a state title. He was drafted in the 26th round by San Diego that year, but likely would have gone much higher had he not announced plans to play at Arizona State. Hahn’s college career lasted three games. Playing against New Mexico on Feb. 20, 2011, he suffered a spinal injury after sliding head-first on a steal attempt and colliding with Lobos second baseman Kyle Stiner’s knee. Hahn was taken off on a stretcher and had surgery later that night, but was paralyzed from the mid-chest down after fracturing his C-5 vertebrae. He’s spent the past two years helping Arizona State’s program as a student coach. The Diamondbacks waited until the 34th round to pick Hahn because he wore No. 34 at ASU. A nice gesture by the Diamondbacks. Picks in the 34th round or later seldom develop into star baseball players, Mike Piazza being a notable exception, so no harm was done. He broke an age record he set himself back in 2011. The 48-year-old Hopkins broke the record he set by beating Jean Pascal for the WBC light heavyweight title on May 21, 2011. When asked which fight meant more, Hopkins said “tonight was better. Because I’m older. (It’s) more gratifying. “It was great to break (in) the Barclays Center with a (legendary) performance,” Hopkins said. A 48-year-old can win a boxing title. Is it because of a lack of good fighters in his weight class or that there are too many boxing titles. Intercontinental and WBO. Not to mention the IBF plus WBA and WBC. Sounds like too much alphabetical soup to me. A tentative agreement has been reached between the NHL and the players’ association. NHL commissioner Gary Bettman and NHLPA executive director Donald Fehr stood side by side in the early hours of Sunday morning to announce there was a framework in place for a new collective bargaining agreement. Bettman and Fehr didn’t join hands and sing Kumbaya together. The deal still requires majority approval from both the board of governors — as early as Tuesday — and the NHLPA membership before it can become official. The tentative agreement is a 10-year deal with a mutual opt-out clause after eight years and includes contract term limits at seven years (eight years for a team to re-sign its own players), a source confirmed to ESPNNewYork.com. “I am happy deal has been reached and excited to get back to playing hockey,” Penguins star Sidney Crosby said in an email. For the first year, the salary cap is $60 million but teams can spend up to $70.2 million in the transition period, while the floor is $44 million. Sources said the 2013-14 salary cap, a very divisive issue, will be $64.3 million, while the floor will remain at $44 million. Contract salary variance is capped at 35 percent from year to year, with the provision that the last year can’t vary more than 50 percent from the highest-salaried year, a source told ESPN.com. Revenue sharing will spread $200 million, with a $60 million NHLPA-initiated growth fund included. The players did well after the last CBA was agreed to, and I expect the same result this time around. I think some owners may benefit also but the NHL has at least one team with severe financial problems and a couple more possibly waiting in the wings. This labor dispute cost the team owners millions and I wouldn’t be surprised if there is fallout from it. Why did this dispute take four months to resolve? It came down to personalities, the owners don’t like Fehr and both sides complained and whined about the other instead of playing hockey. I’m a die hard Florida Panthers fan who can count the televised games involving the cats over the last five years that they have missed watching on one hand. Right now I have very little enthusiasm for a shortened bogus season. I’ve heard the people in Toronto are nuts about the NHL, now I believe it. If the NHL decides to flush the rest of the season, Toronto Maple Leafs fan Jim Vigmond is ready. The Ontario lawyer purchased a toilet from the home dressing room of Maple Leaf Gardens for $5,300 at an auction, according to the Toronto Star. Vigmond had been trying to score a 1967 Stanley Cup banner but he said the bidding became too steep, so he went for the toilet. And he was willing to go as high as $10,000 on the commode, which his friends thought was a little out there. “They thought I had money to burn, and surely there was something that I could have better spent my money on,” he said, according to the newspaper. Maple Leaf Gardens was home to the Leafs from 1931-99. More than 100 items from the arena were up for auction. Vacant for several years after the Leafs left for the Air Canada Centre, the Gardens was recently converted into a small arena for nearby Ryerson University and a grocery store. As it stands, I don’t expect an NHL game to be played between now and December 31st 2012. The player lockout imposed by team owners is over two months old and no resolution is in sight at present. The golfer nicknamed the ‘Final Round Queen’ lived up to her nickname today. She won the last LPGA major Championship of 2012 by 9 shots over Inbee Park. Just six days ago Shin defeated Paula Creamer in a sudden death playoff at the Kingsmill Championship. Shin shot a 71 to open the tournament, then followed it with a course record 64 to open up a five-shot lead going in the day of play. Due to inclement weather on Friday, players who made the tournament cut, had to play 36 holes today. No South Korean golfer other than Se Ri Pak has won more than one LPGA major. Another tidbit- No South Korean golfer other than Pak has won a double digit amount of LPGA tournaments. As I’ve written a few times, there have been a large number of South Korean golfers who started strongly on the LPGA Tour and then went into decline. Jiyai Shin, winner of the 2008 Women’s British Open, came into today with one LPGA major championship triumph and nine LPGA wins respectively. So she was looking to join Pak. Karrie Webb shot a third round 68 to pull within 3 shots of Shin with 18 holes to go. The weather turned horrible in the short period of time between Webb and Shin finishing their 3rd rounds and teeing it up for the 4th round. Rain and gusting strong winds. The final round was going to be a matter of survival. Shin makes a triple bogey on the opening round of her 4th round. Webb made double bogey but Shin’s lead was down to two. That is as close as it came. Shin played the final 17 holes of her 4th round in 2 under par. Webb, Inbee Park, and Mika Miyazato, all faded. The weather was bad for most of the day, in fact there was a 15 minute stoppage as the winds were just gusting too strongly. It was just incredible how Shin played after the 1st hole. She never came close to another disaster. Her final round 73 may have been just as good as Shin’s course record 64 in the second round. Only two golfers, Creamer and Alexis Thompson, shot better rounds than Shin and they each came with 72s. I think its safe to say Shin is back. The last few weeks look to me look like her making another run at #1 in the world. An official at an athletics event in the German city of Dusseldorf has died after being speared in the throat with a javelin. The 74-year-old man was rushed to hospital after the accident on Sunday but died of his injuries. The official, named locally as Dieter Strack, had gone to measure a throw but was hit by a javelin before it hit the ground, according to local media. The competition was called off after the incident. The 15-year-old competitor who threw the javelin is receiving psychological counselling, police spokesman Andre Hartwig told the Associated Press. A statement on the website of the local athletics association identified the man as Mr Strack and said he was a “much-loved and experienced” sports judge. Very sad and RIP Mr. Strack. The article noted that the accidental death of sports officials is rare. Maybe the most famous case was what happened at the 1977 South African Grand Prix when two marshals tried to run across the racetrack to extinguish a fire. The following video is graphic. The driver of the car that hit the race marshal, Tom Pryce, was also killed. On the same course Hall of Famer Se Ri Pak won the U.S. Open on in 1998, Na Yeon Choi notched her first major championship triumph. She shot a score of 281 for 72 holes to finish four shots ahead of fellow South Korean Amy Yang. Choi won the tournament on Saturday when she shot a 65 to take a six-shot lead over into Sunday’s final round. The final round wasn’t without some drama. After playing the first nine holes in par, Choi hooked her tee shot into a hazard on the 10th hole. She finished the hole with a triple bogey and her lead was cut in half from six to three shots. All other golfers other than Choi and Yang weren’t a factor in the final round. On the 11th hole, Choi bounced back with a birdie. After a good drive on 12, Choi hooked her approach into the deep rough and had such a terrible lie, she was contemplating taking a drop. She didn’t and instead hacked her 3rd shot onto the 20 to 30 feet from the hole which was fantastic considering the circumstances. Choi then made the long putt for par. At the next hole a par 3 with water bordering the green on the right, Choi’s tee shot twice hit inside the hazard line(barely missing the water) before coming to settle just off the back of the green. Choi saved her par again. After 13, Choi coasted in. She made birdies on 15 and 16 but bogied 18 to finish with a final round 73. With the win, Choi became the 4th South Korean golfer to win the U.S. Women’s Open since 2008. Choi becomes yet again another South Korean golfer with one major championship win. Se Ri Pak is the only Korean to win more than one major. I’ll say this however, either Choi or Jiyai Shin should get a second win before their careers are over. Choi’s victory comes as no surprise. She was ranked #5 in the world coming into the tournament and was the LPGA Tour’s leading money winner in 2010. She had five previous wins on the LPGA Tour plus six professional wins in South Korea. Either she or Ai Miyazato was the best female golfer in the world without a major championship win. Miyazato now holds the title undeniably. Se Ri Pak finished a very respectable 9th considering she is likely to have shoulder surgery soon. It was Pak’s success in 1998 that caused Choi and other Koreans to come to the LPGA Tour. Since 2001 South Koreans have won more majors(11) than any other nationality. The United States is 2nd with 10. #1 player in the world Yani Tseng is in a bit of a slump right now. She won three tournaments early this year but has been struggling of late. To me at least, Tseng in the summer of 2012 is resembling Lorena Ochoa in the summer of 2008. Only months earlier both golfers were invincible and suddenly they were off their games. The 4th major of the Women’s golf season, The Women’s British Open, won’t be held until September due to the Olympic games in London a few weeks from now. Choi will certainly be one of the favorites. It was a spectacular evening for Sam Gagner, who scored four goals and four assists to tie a club record and lead the Edmonton Oilers over the Chicago Blackhawks 8-4 on Thursday night. Gagner’s eight-point game tied the club record held by Gretzky and Coffey and fell two points shy of matching the league mark of 10, set by Toronto’s Darryl Sittler on Feb. 7, 1976. It was also the first eight-point game in the NHL since Pittsburgh’s Mario Lemieux did it on Dec. 31, 1988, against New Jersey. The 22-year-old Gagner came into the game with five goals on the season. I had never heard of Gagner before this morning. The Blackhawks started the scoring six minutes into the game as Mayers fluttered a long shot from above the circle that fooled Oilers goalie Devan Dubnyk. Chicago kept pouring it on but hit a pair of posts — a long blast from the point by Brent Seabrook and another from in close by Andrew Shaw. Just 40 seconds into the second period Chicago made it 2-0 when Patrick Kane fed it to Sharp who found a clear lane to beat Dubnyk. The Oilers responded less than two minutes later as Gagner earned his first point of the night. With a long pass Gagner sprung Hall who chipped in his 18th of the year past Chicago goalie Corey Crawford. Hall has scored in three straight games. Gagner then tied it just over seven minutes later when he picked up his own rebound, circled behind the net, and scored on the wraparound. The Oilers took a 3-2 lead with seven minutes remaining in the second as Whitney ripped a shot from the point while on the power play for just his first of the season. Gagner earned the assist. Chicago tied it two minutes later on a short-handed 2-on-1 as Dubnyk gave up a rebound to Sharp who buried his second of the night. Gagner made it 4-3 two minutes into the third with his second goal of the night. Whitney’s shot sailed over the net but bounced in front for Gagner to put past Crawford. The Oilers chased the Chicago goalie two minutes later when Barker fluttered a shot from the point that Crawford waved at as it went into the top corner. 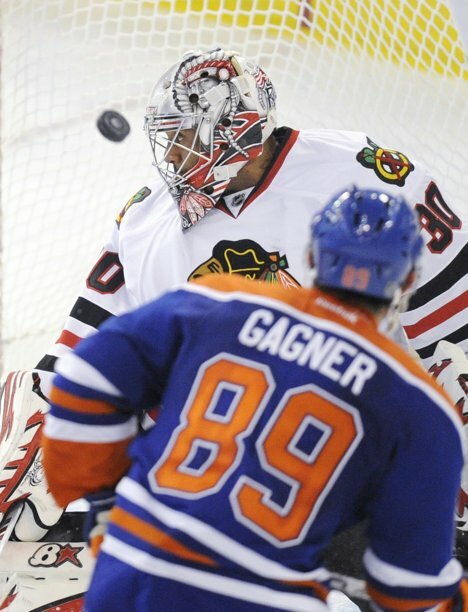 Gagner earned his third assist and Ray Emery replaced Crawford. The Blackhawks got a goal back six minutes into the third as Bolland made a no-look backhand swat at a puck that squirted past Dubnyk. Gagner completed the hat trick 30 seconds later to make it 6-4, as Hall spun around and found Gagner streaking for his sixth point of the game. Eberle and Hall did terrific tic-tac-toe passing to get Gagner the puck, and he slapped his fourth of the game into a wide-open net as Emery slid to keep up with the play. Gagner’s heroics brought a little bit to an otherwise dismal Oilers season. If not for the horrid Columbus Blue Jackets, Edmonton could finish with the worst record in the entire NHL. Just like they have the last two years.